Avatar, released in December, is causing ripples all over the world: the storyline and acting are excellent and the science is plausible. But the big talking point is the fact that the movie is in 3D. Eddy, a good friend, watched the film in the UK and loved it. Personally, I am hesitating a lot about whether I should go to the cinema to watch Avatar. I love watching movies in their original version and, as far as I know, we’ll be getting Avatar in French here. I own an Apple iPod Nano and I use it mostly everyday to listen to music in the car. I add that I also use iTunes to manage my music collection and I like it a lot. A few months ago, I stumbled upon a new feature of iTunes called Genius Mix which essentially “explores your library and finds songs that go great together.” The major issue was that Genius Mix requires an iTunes store account which, well, we, Mauritians, can’t have… except that Mauritius Telecom has been nice enough to explain how to get one, ahem, obliquely. 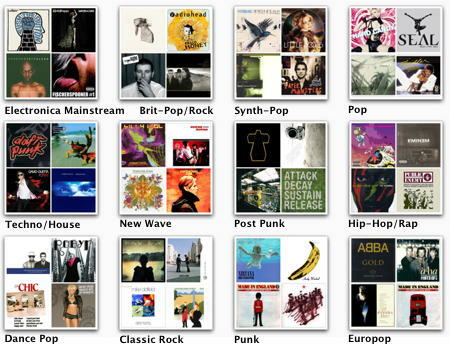 When I launch iTunes now, I am greeted with the selection shown above and I can easily choose whether to indulge into some Electronica, Brit-Pop/Rock, Synth-Pop, Pop, Techno/House, New Wave, Post Punk, Hip-Hop/Rap, Dance Pop, Classic Rock, Punk or Europop. Life is cool. I have my own DJ. And she knows what I like.